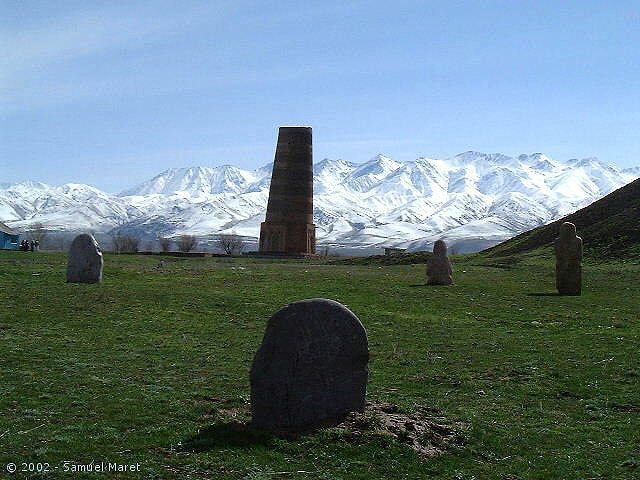 Today, all that remains of this once thriving capital is its minaret, a grassy mound covering the ancient citadel and the remains of Karakhanid mausoleums. 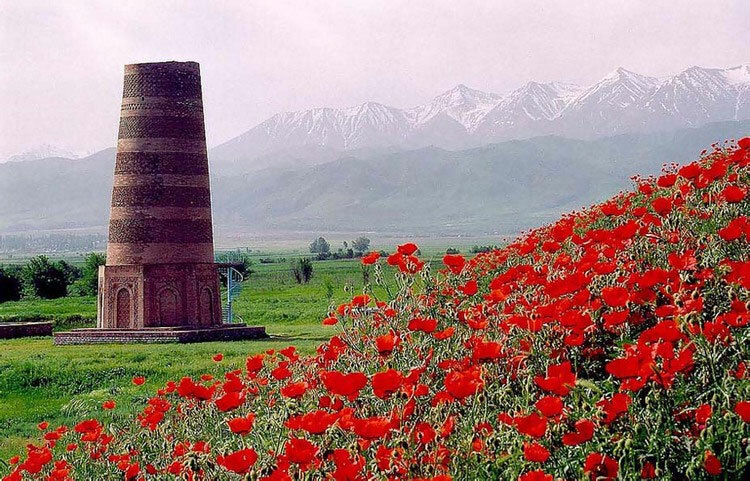 Burana's enormous minaret was renovated in Soviet times, and from the top offers spectacular views of the surrounding mountains and Chuy Valley. One of Burana's biggest attractions is its open air museum, to the north of the tower. 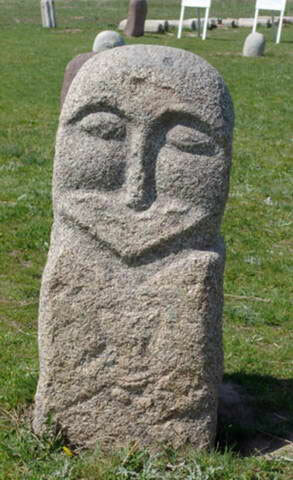 Here visitors will find a collection of stone figures (balbalii), sculpted in the 6th-10th centuries and used as grave markers. Beside the balbalii lies an interesting selection of petroglyphs depicting hunters and deer, some dating from the second century BC. Also on display are several 14th century stone tablets, covered with Arabic writing and a collection of stone tools found in the area. A small indoor museum, covering the history of the area, displays a good collection of Silk Road era archaeological finds. Although Balgasun itself lies ruined, a visit to this bleak, isolated spot is enough to fire the imagination of even the most hardened traveller. As Lin Jingyuen writes, - "All in all, for the historically-minded, the Burana environs evoke images of a distant and forgotten past, in which Silk Road caravans, laden with cargo of East Asian luxury, descend from the mountains to the plains to stop briefly in Burana before continuing their journey - still so far to go - to the west". Situated 10 km to the South of Tokmok - the tower is all that remains of the ancient city of Balasugan, set at the entrance to the Shamshy valley. Established in the 10th century on the site of an older settlement, the city was the birthplace of the poet Jusup Balasugyn (1015) who wrote an epic poem called Katadgu Bilig ("The knowledge which brings happiness"), which has been translated into several languages - including a recent translation into English by Walter May. Along with Kashgar, Balasugan was one of the capitals of the Eastern Khanate when the Karakahanid state split up. (The capital of the Western Khanate was Samarkand). 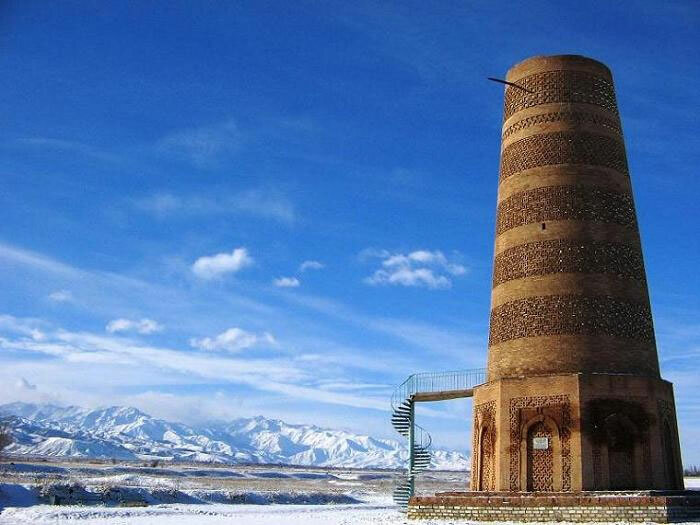 It was spared from destruction by Genghis Khan's Mongols, and renamed Gobalik ("good city") in the 13th century, but it lost its importance and had disappeared by the 15th century. There were major archaeological surveys of the site in the 1920s, 1950s and 1970s. The archaeologists discovered that the town had a complicated layout covering some 25-30 square kilometers. There were ruins of a central fortress, some handicraft shops, bazaars, four religious buildings, domestic dwellings, a bathhouse, a plot of arable land and a water main (pipes delivering water from a nearby canyon). Two rings of walls surrounded the town. Although the Kharakanids, (who built the city) practiced Islam, they were tolerant of other religions and there are some examples of early Christian (Nestorian) inscriptions. The entire museum complex today covers some 36 hectares. 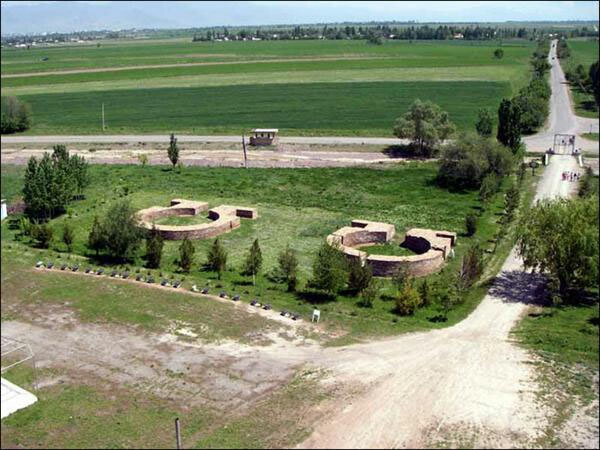 It includes the tower itself, reconstructions of mausoleums found on the site, a mound that is all that remains of the palace/citadel, a collection of balbals (grave markers used by nomadic Turkic peoples who used to roam Central Asia), petroglyphs (paintings on stones) and a small Museum. An embankment on which were built the town walls, made of wattle and daub, would have surrounded the town. 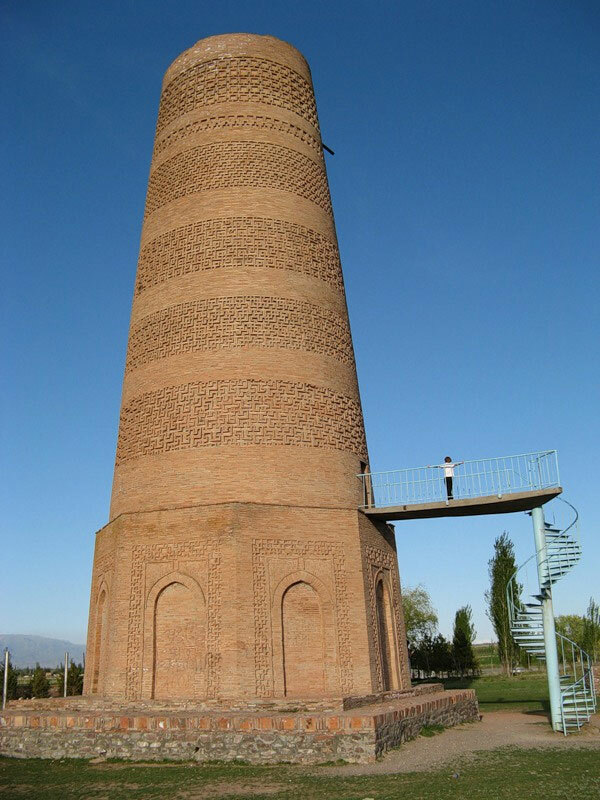 The tower is considered to be a minaret - and is the oldest in Central Asia. 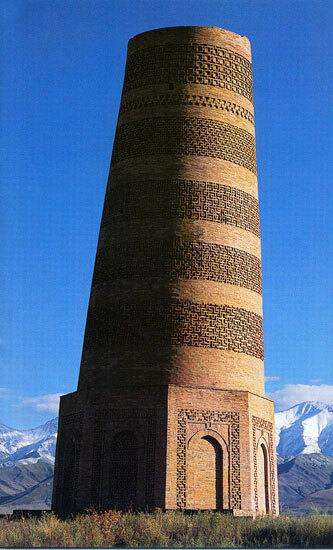 The name Burana itself is probably a corruption of the Turkic word Murana (minaret). A similar, smaller construction has been preserved at Uzgen, near the Uzbek border, complete with a domed crown and doorways from which the muezzin would call the faithful to prayer. Originally 45m tall, only the bottom 25m remain - the top was lost in an earthquake in the 15th century. The tower has an octagonal base and on this was constructed a conical tower. On the outside of the tower is a pattern of relief work in brick. The diameter at the bottom of the tower is 9.3 meters and the top is 6m across. The remains were "cannibalized" by local people, who took the bricks from the base to build houses - photographs of the tower before reconstruction in the 1970's can be seen in the small museum and show this clearly. Inside is a narrow spiral staircase that is said to be original, leading to the top. Access would have been by removable stairs, or through the roof of the mosque - now there is a metal staircase leading to the door nearly 7m above ground on the southern side. From the top opens a great view of the Chu valley and Tokmok. Also, it is possible to make out the lines of the walls of the settlement in the fields surrounding the tower. At the foot of the tower are some reconstructions of the foundations of several ancient mausoleums, made out of baked brick. These foundations were uncovered in the 1970s. The different shapes and sizes indicate the different status and numbers of the occupants. Nearby is a small hill, measuring 100 metres square and 10 metres high. It apparently hides a palace complex (or a temple - archaeologists aren't sure), which existed in the 10th century - which is before the town itself came into being. 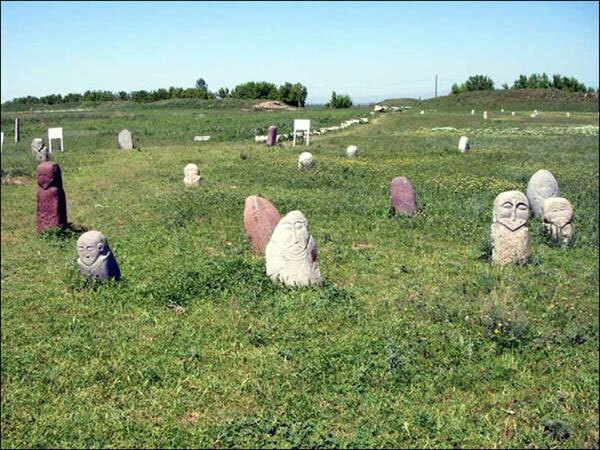 A little further away is a collection of "bal-bals" small statues of the dead - gravestones of the nomadic Turks) dating from the 6th century, and petroglyphs dating from the 2nd century BC, brought and placed here from all around the Chu valley. There are other collections around the Chu valley and in Southern Kazakhstan. The small museum, established in 1976, has some artifacts recovered from the site, (jars, coins, a board game …), but it is claimed that the best articles were removed a long time ago to Moscow or St. Petersburg. In the Shamshy valley itself a wide range of Scythian artifacts has been found, including a heavy golden burial mask. From the Tower, it is easy to travel to the mountains and view the Kegeti or Shamshy gorges. Frustratingly, these wonderful petroglyphs, only 20 km from Bishkek, are situated just over the Kazakh border. Bureaucracy decrees that visitors must be in possession of an muliple-entry Kyrgyz visa and a single entry Kazakh visa in order to visit them as a day trip. The petroglyphs make an easy detour on the journey to Almaty. A particular attraction is that the petroglyphs are not labelled or signed. This leaves visitors to wander amongst rocky outcrops and hunt them out, creating an feeling of discovery and adventure. This ambience is only enhanced by Chumish's location, just on the edge of the endless Kazak steppe, with the Kyrgyzsky Ala-Too mountains rising to the south in the distance.